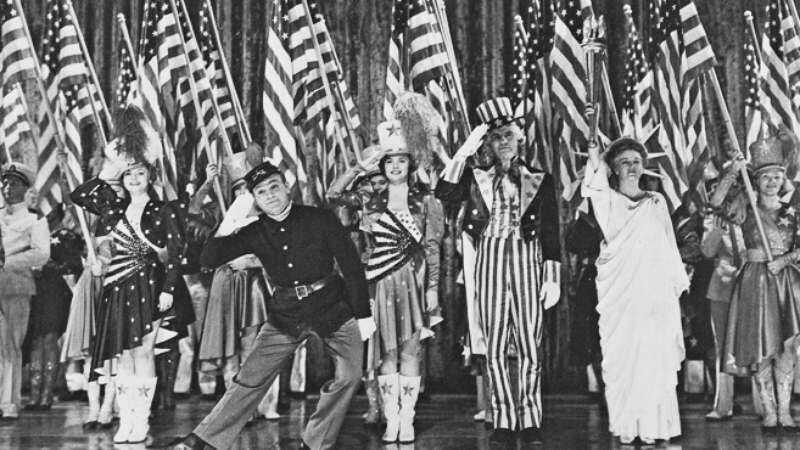 There may be no American movie more patriotic than Yankee Doodle Dandy, a jingoistic biopic of famed Broadway star George M. Cohan that transcends its innumerable genre clichés through the sheer willpower of its star. James Cagney proved that he was more than a gangster—and, in fact, could be a magnetic song-and-dance man—in his Oscar-winning turn as Cohan. At film’s start, Cohan is playing Franklin Delano Roosevelt in “I’d Rather Be Right,” only to be called upon in the middle of the night by the president himself for a White House chat, during which time the actor recounts his life story in flashbacks to the commander-in-chief. It’s a stock tale of the little showbiz engine that could, with Cohan rising from small-time gigs (including an unfortunate one in blackface) to NYC fame courtesy of a string of shows that practically oozed nationalistic joy and fervor, and were highlighted by songs (“Yankee Doodle Dandy,” “Over There”) that remain staples of the holiday on which Cohan was born, Independence Day. Directed by Michael Curtiz—whose most famous hit, Casablanca, was released the same year—Yankee Doodle Dandy has sufficient visual flair to energize its story of an underdog triumphing against all odds while staying loyal to family (Cohan performed alongside his parents and sister throughout his career), business partners, and wife. Even as it threatens to engender eye rolls through its conflation of Cohan, the founding fathers, and WWI and WWII servicemen (not to mention the theater and wartime duty), the film is a sturdy showcase for its electric headliner. Prancing about the stage on his toes and at an almost impossible slanted angle, Cagney is a whirlwind of confidence and charm as a man convinced, from his incessantly blabbering mouth to his tapping feet, of both his and his nation’s unrivaled greatness. It’s a performance of indefatigable verve, and one that elevates this sincere celebration of both the arts and the U.S. of A. Availability: Yankee Doodle Dandy is available on Blu-ray and DVD through Netflix or possibly your local video store/library. It can also be rented or purchased through the major digital services.